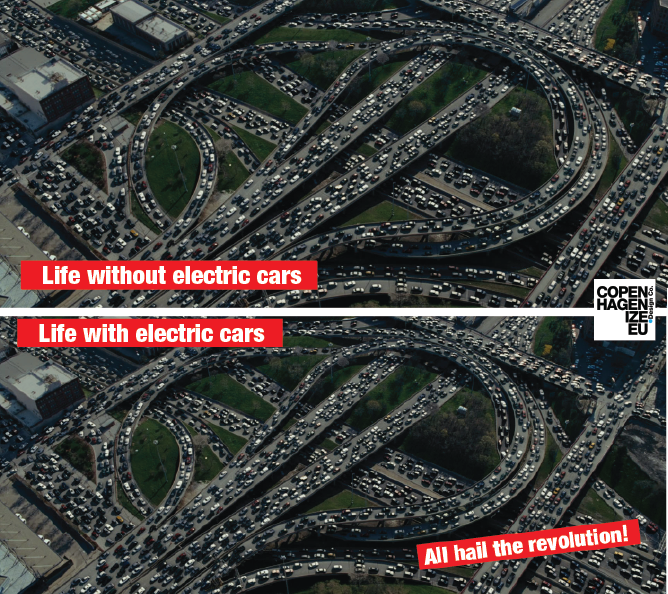 Copenhagenize.com - Bicycle Urbanism by Design: Electric Cars: Where Will the Energy Come From? Electric Cars: Where Will the Energy Come From? Copenhagenize Design Company Guest Author, Jason Henderson, is Professor of Geography & Environment at San Francisco State University, visiting Copenhagen this Fall on a research sabbatical examining how culture, politics, and economics shapes transportation in Copenhagen. Jason is author of Street Fight: The Politics of Mobility in San Francisco (2013), and co-author of Low Car (bon) Communities: Inspiring Car-Free and Car Lite Urban Futures. He has published articles in International Journal of Urban and Regional Research, Antipode, Urban Geography, the Journal of Transport Geography and several book chapters in academic books on sustainable transportation and the politics of the automobile. He is a Master Class by Copenhagenize alumni, as well. Electric cars are often touted as a promising response to climate change, reducing air pollution, and bringing energy security. So it’s not surprising that the world’s climate policy leaders and largest car markets, like California, Germany, and China, are promoting public policbatteries subsidizing mass electric motorization. 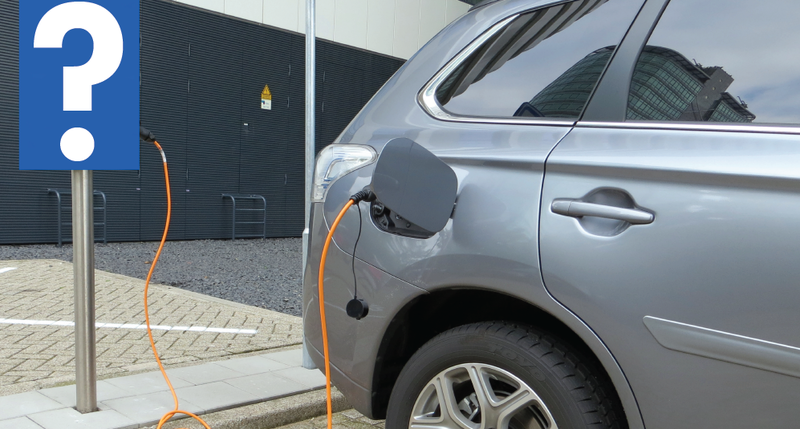 Even the world’s greenest transport nations, like bikey Denmark and rail-rich Switzerland are joining the bandwagon, while the Netherlands seeks to nudge electric cars by banning the sale of conventional gasoline cars by 2025. The allure of electric cars is that they’ll run entirely on renewable energy like solar and wind – if not now, then at some point in the future. This is where proclamations like “green cars,” “carbon neutral” and “zero emissions” comes from. But when deconstructing the energy situation as we know it, no one shows how this assumption adds-up. For example, if we scan the renewable energy horizon, there are existing legitimate claims on this renewable energy for greener homes and public transit. No one, and especially the electric car enthusiasts, seem to be accounting for these competing claims. Before the world invests trillions of dollars and Euros, and unfathomable amounts of natural resources into transitioning to mass electric motorization, we need to ask more pointedly and critically: Where will the energy come from? And what will that look like? California to Europe to China, it is hoped that homes will be running on renewable energy, and this is considered key to a more sustainable climate future. In Denmark, arguably coming the closest to this goal (but with only 5 ½ million people), wind turbines can light most homes on certain days. This is really impressive, and on windy days Denmark has more electricity than it knows what to do with. But in the winter, coal, gas, and household garbage are burned for heat, and Denmark’s boastful wind program is not scaled for running cars. Some dismiss this concern by saying batteries (yet to be built) can store wind-generated electricity as backup for days when winds are down. Yet shouldn’t this “stored wind” go to the homes and offices that don’t get the wind power when winds are calm? How is this battery scheme going to provide the same scale of car-mobility existing in Denmark (which is low compared to other motorized nations like Germany and the US)? And what about the electricity needed for fully electrifying Denmark’s railways and Copenhagen’s metro? Shouldn’t the wind go towards rail first? In California, where air conditioned Mc Mansions sprawl across deserts, the newest utility-scale solar installation can power 140,000 homes on an optimal day. It cost over $2 billion with an 80% Federal subsidy. Now (doing back-of- the envelope math) build 87 more of those to supply existing 12-13 million homes in California, and an additional 40-50 or so for the 20 million additional Californians in 2050. That’s a massive industrial outlay. We might decide it is necessary to sacrifice deserts, but let’s make sure to recognize this only accounts for California’s homes, not exports to less sunny regions of the US, nor California industry and offices – and certainly not a mass electric car fleet (today California has 24 million cars). Now consider that California’s high speed rail program, currently under construction, claims 100 percent renewables in the future, and that Los Angeles, San Diego, San Francisco, and Sacramento plan to expand electric rail in the next few decades –all purportedly carbon neutral. Add this into the energy mix: California has a declining snowpack for hydropower, which now provides less than 7 percent of the state’s electricity (can you say drought?). Wind, which has expanded rapidly in the past 15 years, and provides 5 percent of California electricity when it is windy, might be reaching build-out. The windy coast range passes are covered in turbines, except in places like affluent, and notoriously NIMBY Marin County or Big Sur. There’s offshore, but the real estate and tourism industry might balk at the view. The mighty Sierras could offer up some valleys if the locals and environmentalists agree. All of this is to say that California is possibly close to peak utility-scale wind, at least in the current land use politics regime. Then there are the renewables themselves. As electric car enthusiasts envision it, both electric cars and the renewables propelling them are carbon neutral and fossil fuel-free. Not so. The batteries, both for the cars and for the extensive storage of wind and solar power, are manufactured from mined materials, like lithium, with many toxins and disposal problems. The battery factories, whether in China or Nevada, will not run on wind or solar (unless you divert wind and solar from households at a massive scale). The factories now, and in the future, will run on coal, gas, and oil. The nanomaterials take massive amounts of energy to produce, and will emit greenhouse gases far more intensive than carbon. There are magnets and rare earth metals. There will be steel, produced from iron. Denmark might produce a “green” electricity surplus on certain days in windy Jutland, but the true carbon footprint is displaced to China, Germany, and other global steel, batter, and car manufacturing centers. Electric cars will continue to have rubber tires – that is, petroleum – as well as plastics, lead, aluminum, and all kinds of chemicals that contribute to more intensive GHGS than carbon. There will be vehicle maintenance including replacement tires and electrical gadgets, and then disposal or recycling. All taking massive amounts of energy and resources – none of which show up in California or Denmark’s GHG budgets. equipment. Copper. Glass. Plastics. More aluminum. More intensive GHGs from plasma production equipment, more toxic waste, silicon wafers, various hydroxides, arsenic, lead, chromium, and more. Ditto for wind turbines – mining, fabrication, transporting, installation, land clearance, and carbon-intensive concrete to anchor and steady the towering turbines. To truly scale-up to a global mass electric car system, entire deserts, sweeping plains, all of our shallow seas, and all of our mountain passes will need to be completely covered in silicon, steel, and plastic. An escalation of energy consumption of tremendous proportions. Then there’s escalating mobility of the electric car. 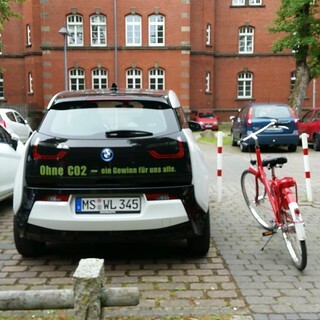 The driver will drive more thinking the car is green. Electric car/solar enthusiasts will resolve to cover their homes in panels to recharge home and car, straight out of the Whole Earth Catalogue, but this requires single-detached homes for optimal solarization– the formula for sprawl and more driving. The electric car, as a thing in itself, might not be such a bad thing in isolation. But the dream of mass electric motorization replacing our existing system of automobility might be a nightmare. Maybe we should save our fossil fuels and GHG emissions for constructing high speed rail and electrification of mass transit, look to human-powered bicycles and compact, walkable cities, all the while using the wind and solar arrays for our more-efficient homes. So here’s a challenge to the electric car industry and to anyone dreaming of an electric car future. Show us the numbers. Where will the energy come from, and what does that look like really?